It seems counter-intuitive, but writing is a visual medium. Authors have the delightful task of imagining vivid worlds, peopling them with interesting characters, and then inviting readers to join us for an adventure in our own peculiar land beyond the wardrobe. It’s difficult to understate the importance of setting to a story. The Lord of the Rings would not have the impact that it does if Tolkien had not given us the Shire to contrast against the smoldering wastelands of Mordor. It has almost become a trope for New York City to rise to the level of becoming a character in movies and novels. Howard Carter’s story was no less dependent on the rolling fields of my native Missouri. That sense of place is built slowly, not just with description, but consistency. When I walk into the foyer of my main character’s home, the dining room must always be through the righthand door and the parlor through the left. The bedroom must always be at the front of the house and not wander about the place like a room in Hogwarts. At the moment, I am writing a novel that takes place largely in the city of Seattle and the surrounding countryside. There are apartments, mansions, bungalows, labs, a rare book repository, gardens, rivers, lakes and streams. Many of those locations appear more than once and every time you go there I need to know what it looks like, what it feels like, and how the place is laid out. I don’t know how other authors do this, but after years of playing roleplaying games, I find it easiest to make liberal use of blueprints and maps. 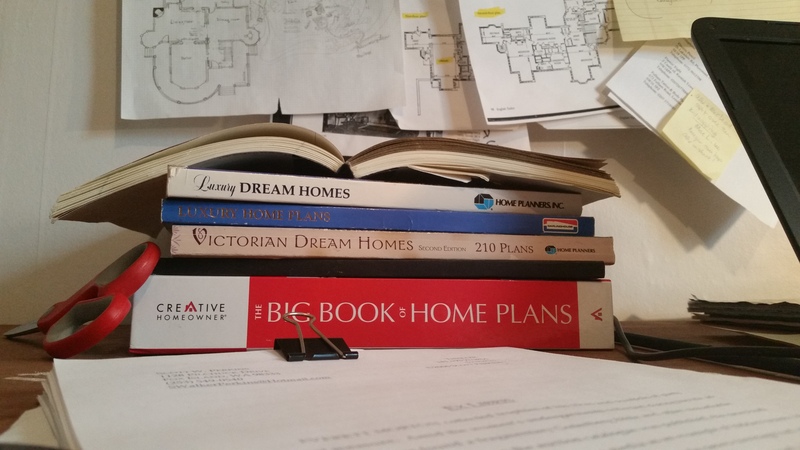 Books of home plans are immensely valuable for this. If I have a schematic of the house, the dining room will always be where I put it on that first visit. MacLeod House is a big old Victorian place with all the turrets and gables and widows walks you could hope for. The family is wealthy and they’ve owned the land since before Washington was a state. All of those things are good to know, and mapping the house is a great first step. But the picture (and the map) gets bigger. Because there’s action that takes place on the grounds, I have to describe them at least a little. It’s imperative, for instance, that you understand how secluded the place is, how the buildings are situated and some of the general geography, including the complicating factor of navigating over and around Puget Sound. Yes, this novel has a water hazard. The trickiest thing about settings like this is putting you in the scene without plonking a series of maps at the front of the book and forcing you to constantly consult them to figure out where you are. Some day, maybe there will be an eBook format that is geo-coded so you can tap any page and see the location in real time, but that sounds a bit boring, doesn’t it? So this is the hardest part of writing for me — not the description of a place, but deciding how much to put in and what to leave out. This is where the “Write for yourself” rule runs off the rails. While it’s a truism that you’ll never create anything great if you’re not ultimately creating it for yourself, a novel is not a diary; you can only write selfishly for so long before it becomes self-destructive. Yes, you’re building a world, but you’re building it for others. You have to sketch it in and leave some blanks for the reader to populate on their own. Fantasy is where this is most obviously at work. If I close my eyes and picture Hogwarts Castle, the image in my head looks very little like the one in the movies. I’ll wager it looks nothing like the one in your head or JK Rowling’s either. That’s part of what makes it a good setting. But a mystery novel set in the misty streets of Victorian London or modern day Seattle are no less dependent on that “just enough for getting on with” rule of place-setting. This is one place where a I must emphatically write for myself and revise for my readers. The first pass of my manuscripts are usually 10,000 – 30,000 words longer than anything you will ever see in print. That’s the draft I wrote for me and it’s chock full of the kind of selfish word painting that happens when I indulge my urge to force the readers to see it exactly like I see it. The first pass in the revision process is about taking almost all of that out. I print the manuscript and read with a highlighter and Post-it notes in hand. I scribble in the margins and try to look at it dispassionately as an editor or agent might and when that fails I delete what I can and send it to those friends who won’t hesitate to scribble “Architectural Digest called, they want their article back” in the margins. Ultimately, it’s my name on the cover and I don’t always listen. It comes from a pure place, this selfish desire, a place where I had this amazing dream and I want you to experience it too. But in the end, I’m not painting this world of mine, I’m sketching it in. I’m not writing about the house or the gardens, I’m writing about the people who inhabit them and using the spaces to set a mood and create impressions of the occupants. That’s all settings should be doing, creating a stage for events and reflecting the characters that inhabit them. Does this detail illuminate a facet of the characters that you want to imply without describing? Modern or traditional? Simple or ornate? Neat or sloppy? Are there dishes in the sink? Coffee cup rings on the desk? All of these setting details things provide subliminal dimension to the characters. Does this detail anchor the characters or move the plot forward? No? Cut it. Would your POV character know it? I know a lot about architecture, woodworking, and art history, but does my character? Would a bookish historian know walnut from oak? Can she tell Queen Anne from Gothic Revival? This kind of narration is an easy cut. How much action is going to take place there? The more events transpire in a place, the more concrete it should be in the minds of readers and especially the writer. If you’re going to have a foot chase across a landscape, you should know that landscape and the details shouldn’t change from scene to scene. Take out anything you’re not sure of or find out if you’re right. There aren’t any fireflies in Western Washington. If you put them in your narrative, you’re going to get letters. The biggest annoyance I have with the TV show Grey’s Anatomy is the number of thunderstorms they have. It’s set in Seattle and we don’t often get that kind of storm. When it thunders it’s news. Be sure, or don’t put it in. It’s a novel, not a travel guide. I love Western Washington and I want you to love it too in the minutest detail. I return from backpacking trips with a cameraload of photos of everything from the sweeping vistas and to the interesting moss on rocks. (Seriously, look at my Instagram some time.) So on that first draft looks like that photo gallery. But I don’t work for the tourism board; I work for the reader, so most of it has to go.